Proof that oil does not equal grease! 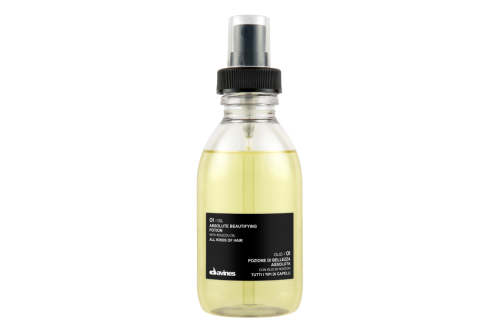 Davines’ Oi/Oil Absolute Beautifying Potion is a significant formula that softens hair and adds just a subtle hint of polish. This product can also be transformed into an overnight conditioning treatment; just a spritz on your fingers and run them through your hair, starting a few inches below your roots. This finishing and styling oil leaves your hair shiny and smooth with a delightful leafy vanilla scent. The natural ingredients in the beautifying potion create a protective film on all hair types and prevent hair from aging with a strong anti-oxidant action. At Pistachio we carry the Oi/Oil Absolute Beautifying Potion in two sizes, 135 ml and 50 ml. Stop into Pistachio today to check out this impressive treatment!